Government officials are guilty until proven innocent. That is the inherent difficulty of working for the public. People assume there is some impropriety going on, like public funds being appropriated for the upkeep of ten wives or, in the case of a certain district representative of the City of Purple Structures, the purchase of the services of a foreign beauty whose job is to convince constituents that her man doesn't live in a closet wearing a tutu, only a tutu (this is a blind item in case you're wondering). So how do elected officials and representatives prove their innocence or at least create positive images for themselves? a. Die an early and tragic death so their political party mates can belatedly lionize them thereby exposing all their good deeds. b. Find space to plaster their diamond-toned faces in tarpaulins for every birthday, christening and fiesta in town so people can confuse their visibility with actual work accomplished. d. Dance to Nikki Minaj's latest blasphemy, despite being grandfatherly and having four left feet, during election campaigns so people can confuse looking stupid in public with concern for public welfare. But all they really should be doing is to sit and talk. There's nothing like a casual chat to reveal if a politician has sense and if he has his own opinions about things that matter rather than relying on speech writers to supply them copied words from well written blog content and Wikipedia articles. Enter the subject of our video above, first term Aurora Representative Juan Edgardo "Sonny" M. Angara who graciously sat with a group of bloggers and gave his opinion on matters ranging from the RH Bill to the definition of love, which, in the heady mixture of fruit shakes and fries morphed into defining Mar Roxas. Of course, it's impossible to completely measure a man through just one conversation but this beats having to determine how worthy he is by virtue of a digitally enhanced tarpaulin or his dancing skills. If you want to find out more about Sonny Angara and his achievements, refer to Google. There's enough there about who he is and what he's done, but if you want to really hear him speak, watch the video. If he ran for senate next year, would you vote for him? 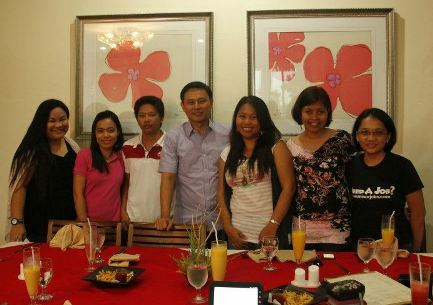 Rep. Sonny Angara with bloggers. Photo by Ding. kudos to him, hindi kagayan ni Tito,yabang kasi binabasa ang mga siansabi na plagiarized naman at lately nga ay plagiarized and translated naman. In choosing a politician, he must be a man of integrity,a man of faith and the like. It may take us a long time to decide, but we must at least think, think and think again so we won't waste a vote just like Sen. Sotto. I guess we'll just have to wait and see until he gets a seat on the senate and prove his worth. I just hate the idea that there are already tv ads about him re: Senior Citizens Act. Too early for 2013 :) But he seems like a nice guy. He is eyeing for higher position for sure. But he seems nice though. I am not sure yet even if he is carrying a popular name. I will first check on his achievements if he really deserves my precious vote. That's me . . . choosy! Thanks for sharing this. This will help me on making my list (u know what I mean). He seems to be real and a nice person. i find him humble too. nice to hear an outstanding politician. i hope he's going to continue being good. ...well, I don't know just yet. For me, the answer is they can't and they won't. Once the people have already made up their mind based on what they have seen and read (no matter how little or inaccurate it may be), it's pretty much like etching it in stone. So no matter how much you try to prove otherwise, they will choose not to listen or see. probably not... but not because he is his father's son...I know it's unfair to judge a son by the kind of father he has (I for one hate that) but rather because, he still has to prove himself in my book.